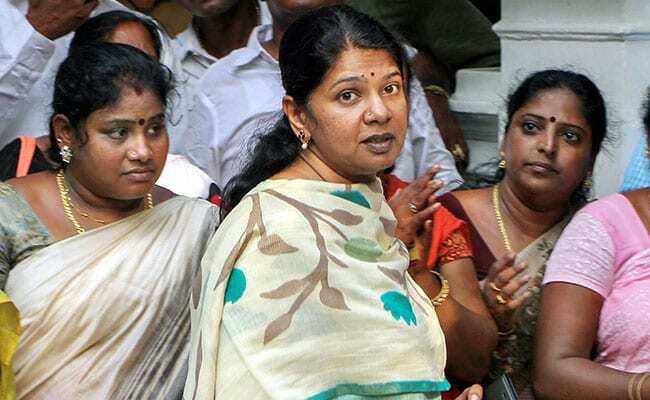 Lok Sabha Polls 2019: DMK MP Kanimozhi calls Modi government "anti-national"
"The BJP is anti-national. They've destroyed the country's economy, they've destroyed the secular fabric of the country, they have destroyed the country's diversity," Ms Kanimozhi told NDTV. She also took on the ruling AIADMK and called it "The B team of BJP". The two-time Rajya Sabha parliamentarian favours the roadshow style of campaigning. She climbs atop her caravan at designated spots along the campaign route at which party workers, including large numbers of women, wait with flags and, on occasion, drummers. At times she leaves her vehicle and interacts with supporters. Her convoy is often stopped by woman students. On one occasion, she posed for a photo with a young girl, offering her a chocolate. The daughter of former Tamil Nadu chief minister MK Karunanidhi, she said votes cast in her favour help connect her with the people of the state. She said ensuring justice for the families of 13 people killed in anti-Sterlite protests in May last year was her key election issue. "People have not forgotten or forgiven the killing of 13 people," Ms Kanimozhi said, adding DMK party chief MK Stalin is set on shutting down the Sterlite-owned copper plant. "We need not bring polluting industries. There are plenty of small industries, including many match factories that have been shut down. I'd take efforts to revive them so we would have jobs created," she said. Ms Kanimozhi also promised voters to work on improving job opportunities in her constituency. When asked why only two women were contesting the elections on DMK tickets, she said, "Once the Women's Reservation Bill is enacted, many women will be contesting elections." In 2014, the AIADMK swept the DMK aside on its way to an emphatic win. This time, however, after the deaths of Tamil Nadu's political icons Karunanidhi and Jayalalithaa, the two parties have sought to form strong alliances with both national and regional parties. DMK has struck an alliance with the Congress, in addition to making deals with the VCK, MDMK, CPI, CPM, IUML and a few other smaller parties. The ruling AIADMK has struck an alliance with the PMK, DMDK, PT, TMC and a few other smaller parties. In addition to the Lok Sabha polls, Tamil Nadu is also scheduled to hold by-elections in 22 assembly constituencies in two phases. The ruling AIADMK is five seats short of majority and the DMK hopes for a midterm swing in its favour. "We are confident we would win as many seats in both Lok Sabha and assembly seats," Ms Kanimozhi said.